Australia's Evans endures challenging weekend in Italian motocross championship. 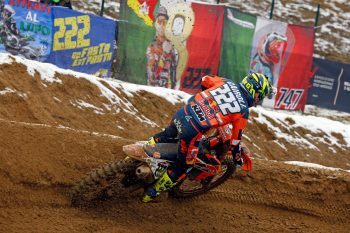 Multi-time world champion Antonio Cairoli has remained undefeated in the Internazionali D’Italia despite battling illness at Ottobiano’s second round at the weekend. The Red Bull KTM Factory Racing rider dominated the MX1 outing in extremely cold conditions, fending off a challenge from Romain Febvre (Monster Energy Yamaha Factory Racing) in second, followed by Tim Gajser (Honda HRC) in third. The Italian ace maintained his dominance in the Superfinal, which sees the top 20 riders from MX1 and MX2 combined, claiming the win over Gajser and MX2 world champion Jorge Prado (Red Bull KTM Factory Racing). 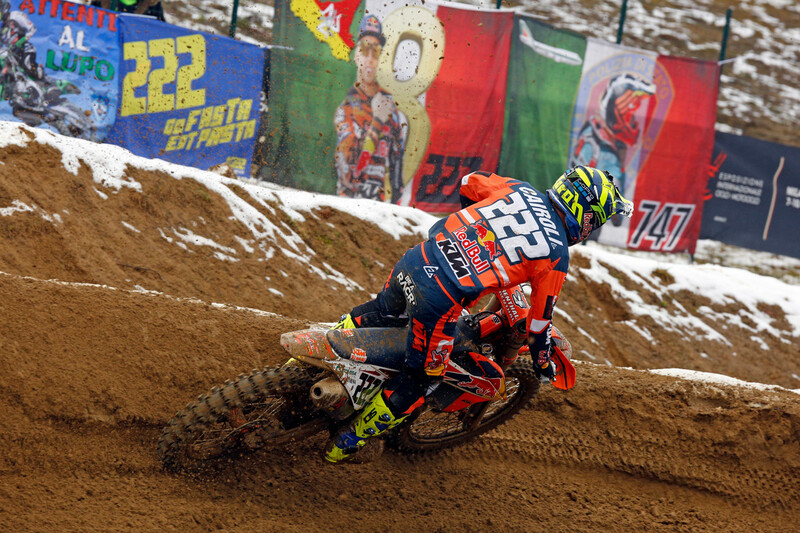 “A very difficult race because the track was tricky with a lot of ruts,” Cairoli explained. “I was feeling okay today but it was a difficult week. I had a fever until Friday night and only started to feel a bit better on Saturday. I had a good rhythm in the first moto and could take home the win. The MX2 class was topped by Prado, as Australian Mitch Evans (Team Honda 114 Motorsports) charged through the demanding conditions to wind up 24th, putting him out of contention for the Superfinal. Compatriot Caleb Grothues (SDM Corse Yamaha) didn’t line-up for the MX2 encounter despite completing the qualifying session.